When looking at new converting equipment, make note of the incoming quality of your parent rolls. If they are out-of-round, it may be beneficial to have a dancer system to absorb the “pulsing” created by the high and low spots in the parent roll. A dancer system uses an idler roll mounted on air cylinders mounted. 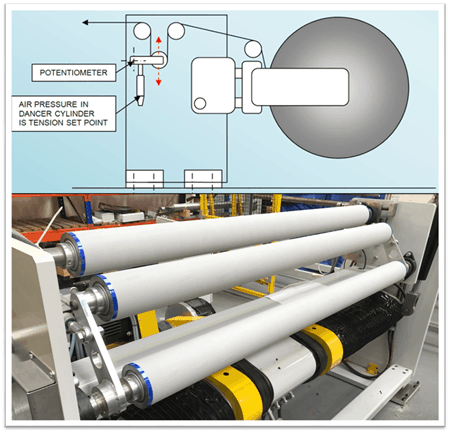 The pressure set point in the cylinders adjusts to account for the fluctuation in the web tension caused by the high and low spots in the parent roll. In doing so, the idler roll is allowed to move up and down accordingly. For slitter rewinders and laminators, this is important to ensure proper web presentation to the knives or lamination nip, respectively.